The Rural AAPT/PTRA project focused on providing professional development opportunities for over 1000 rural teachers at 33 sites across the United States. This project, called the Rural PTRA Initiative, has successfully involved partnerships among university professors, research specialists, and master teachers. Since research indicates teachers need over 80 hours of effective and focused professional development in order to facilitate change in the classroom, the PTRA model provided over 100 hours of instruction and mentoring during a three or four year period. Teachers are provided with resources in content, pedagogy and technology to use in their classrooms. Additionally these teachers became the foundation of a professional and supportive local network for physics teachers. Features were introduced to accommodate teachers in a rural environment (e.g., establishment of AAPT/PTRA Rural Regional Sites at designated colleges/universities, and the appointment of a member of the physics department as a Rural Center Coordinator (RCC)). The RCC arranged and hosted all sessions, but PTRAs in the general geographic area conducted the workshops. Rural participants were able to attend up to 42 works hop hours per year. An additional goal was to identify rural participants who exhibited leadership potential as well as content knowledge to apply for national AAPT/PTRA leader training and thus work toward a locally implemented rural site. The external evaluator for the Rural PTRA project was Horizon Research, Inc. The complete external evaluation for the RPTRA project provided by Horizon is online at http://www.aapt.org/PTRA/horizon.cfm. Summary of the successes and challenges is outlined below. •PTRA provided training to over 130 PTRAs through annual weeklong Leadership Institutes. 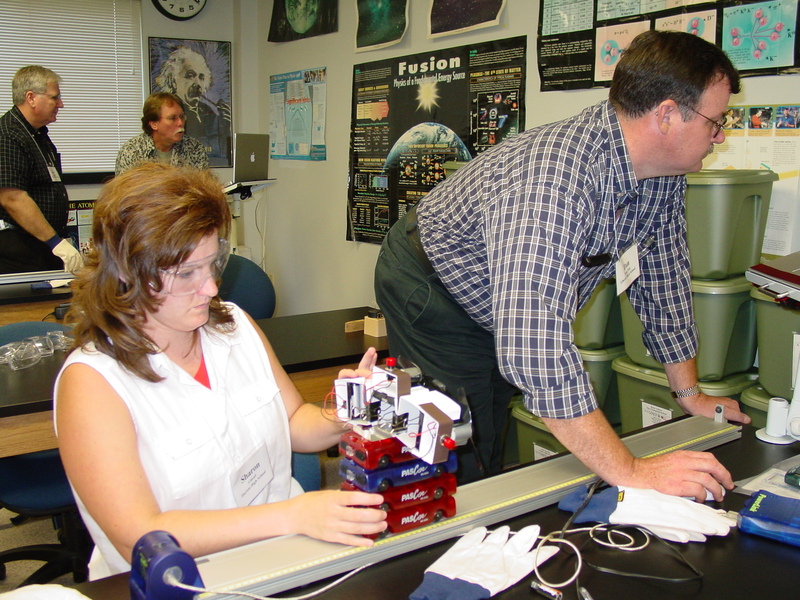 •The PTRA leadership training improved pedagogical content knowledge and increased preparedness to offer high-quality physics instruction. •The institutes had a positive impact on participants’ content knowledge and perception of content preparedness increased with greater participation hours. •Reduced feelings of isolation among rural physics teachers (developed learning communities). •PTRAs need additional knowledge on how to plan, implement, and reflect on the quality of professional development for teachers and working with adult learners. •Implementing change in the classroom is difficult even when teachers change in content, confidence, and pedagogy they need encouragement and support. •Teachers need guidance and feedback to try to implement what they learned. Need vision for high quality instruction. Need more than just the institute. Comparison of pre and post assessment scores of untreated high school students (from teachers before they attended the institute) to treated students (the year after attending the institute), indicated significant gains in student achievement. Participant content assessments were analyzed by site and used for redirection and feedback. The assessments also compiled by topic, year, and eventually across the entire RPTRA project. •More focus on pedagogy and larger “picture” of curriculum instead of trivial details. •More confidence in what they teach. •Enjoyed teaching more and wanted to grow more both professionally and personally. •Teachers spent less time with lecture, working problems, and giving tests and more time with engaging activities, inquiry, cooperative learning, and developing scientific models.